Co-Producer, Pin@y Performance Project, 2003-Present. Emily Lawsin performs with the Pin@y Performance Project at the Midwest Asian American Students Union Conference (MAASU), 2005. 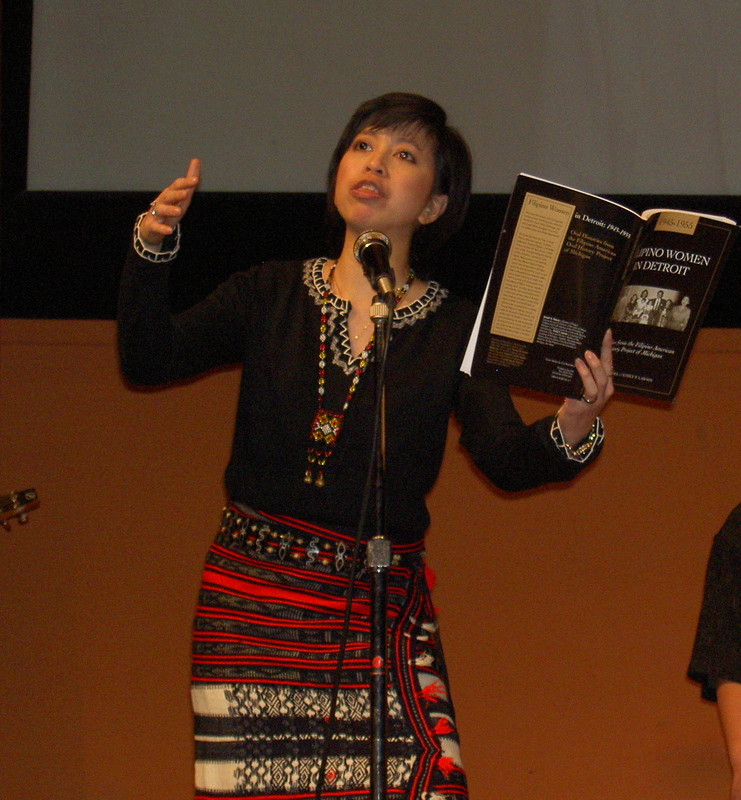 Featured Poet, Philippine Cultural Night, University of Michigan, February & November 2007. Featured Poet, Walk & Squawk Performance Project Jam Session, The Furniture Factory, Detroit, June 26, 2004 and Boll Family YMCA Theatre, April 2006. Group Performance, “History, HERstory, Our Stories: Excerpts from the Filipino American Oral History Project of Michigan, ” Pin@y Performance Project, Midwest Asian American Student Union (MAASU) Conference, Ann Arbor, April 1-3, 2005. Featured Poet, New Visions: Alliance to End Violence in Asian/Asian American Communities Conference, Detroit, October 2, 2004. Featured Poet, Kundiman, Asian American Writers Workshop, Virginia Beach, January 2004. Featured Poet, Detroit Summer Poetry For Social Change Kick-off, October 2003. Featured Poet, Long Hairz Collective Show, Matrix Theatre, Detroit, December 7, 2002. Featured Poet, Michigan Union Poetry Slam, November 16, 2000 & February 7, 2002. Featured Poet, National Asian Pacific Islander American Poetry & Spoken Word Summit, Northwest Asian American Theatre, Seattle, July 29, 2001. Featured Poet, WCBN Live Radio Show, University of Michigan, April 18, 2001. Featured Poetry Video, Merge Diversity Show, Michigan Theatre, March 29, 2001. Featured Poet, Day Without Art, University of Michigan Museum of Art, December 1, 2000. Featured Poet, “World Beyond Poetry Festival of Los Angeles”, Beyond Baroque & World Stage, Liemert Park, Los Angeles, California, June 7, 2000. Featured Poet, “Tabo(o) Art Exhibition,” Claremont Graduate School, February 29, 2000. Invited Poet, “NVM Gonzalez Memorial”, Los Angeles Central Library, Feb. 17, 2000. Invited Performer, “Pinay—Filipina American—Performance,” Asian Pacific Studies Program & Asian Pacific Student Services, University of California, Riverside, May 19, 1999. Featured Performer, with Damian Cordova on percussion, “Isang Mahal: Filipino American Spoken Word Series,” Northwest Asian American Theatre, Seattle, July, 1997 & Dec. 1998. Performer, “Poverty Readers Theatre & Oral History,” FANHS Conference, New York, June 27-30, 1996.